Hastings United Football Club conceded two late goals to lose a match it was on the brink of winning tonight (Tuesday). Chris Agutter’s side went down 2-1 at home to Thamesmead Town in Bostik Football League Division One South after conceding in the 89th and 91st minutes. 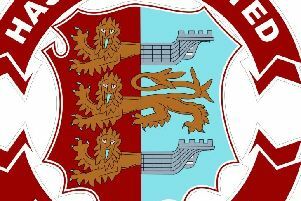 Agutter made three changes to his starting XI from the weekend defeat at Corinthian-Casuals. Ashan Jones made his first start on the right of midfield, Sam Cruttwell returned from illness and Jack Dixon was restored to the XI. Both teams fashioned one glorious chance during a first half which became rather forgettable after a fairly lively opening 10 minutes. Kenny Pogue, who ran his socks off up-front for Hastings with precious little service to work with, side-footed wide on the volley from a great cross by Sam Adams. Minutes later at the other end, Hastings goalkeeper Charlie Horlock produced a brilliant save diving to his left to keep out Laurent Mendy’s header from an Ellis Green cross. Other than that, Pogue brought a good diving stop out of Thamesmead goalkeeper Lewis Carey with a low drive from just outside the D and Joe Denny headed wide for the visitors. Thamesmead had a second gilt-edged chance to draw first blood early in the second period, but Green completely miscued his volley from an inviting position inside the box. Moments later they gifted Hastings a 49th minute lead. A Thamesmead defender made a hash of his back header and Cruttwell nipped in to volley home his first goal of the season. Hastings spent a lot of time defending thereafter, largely as a result of their inability to keep possession. The again impressive Horlock produced another superb save to thwart Mendy and Hastings survived a goalmouth scramble in their own box. At the other end, Davide Rodari headed just wide of the near post from a corner by fellow Hastings substitute Adam Lovatt. The action wasn’t particularly exciting on the pitch, but things suddenly got lively on the touchline as a member of Thamesmead’s management seemed to take exception to Agutter straying into his technical area and pushed him back into his own. Without playing at all well, Hastings looked like just about doing enough until Thamesmead levelled in the 89th minute. A visiting player seemed to misdirect an attempted back header, but it dropped nicely for Paul Vines to drill a sweetly-struck left-footed shot in off the far post. Hastings weren’t far away from reclaiming the lead when substitute Tahjae Anderson did really well to engineer an opening for himself and fired just wide of the far post. The home side failed to deal with the resulting long goal kick, though, allowing Tobi Ajala to slip the ball through for Raphael Duyile to round Horlock and tap into the net, sparking jubilant scenes among the Thamesmead players and management. It was a sobering night for Hastings, who have slipped a place to 15th in the table having lost half of their 14 league games - a record which, like their performance on the night, isn’t good enough. Hastings: Horlock, Beale, Black, Dixon, Vickers, Rowe, Jones (Rodari 69), Cruttwell (Lovatt 69), Pogue (Anderson 82), Johnson, Adams. Subs not used: Akoto, Janneh. Attendance: 279.